Preheat the oven to 350˚F. Butter and line a small square baking pan or a loaf pan with parchment paper. In a medium bowl, over a double boiler, melt the chocolate over gently simmering hot water, stirring, just until the mixture has melted and remove from the heat. Whisk in the butter until well blended. 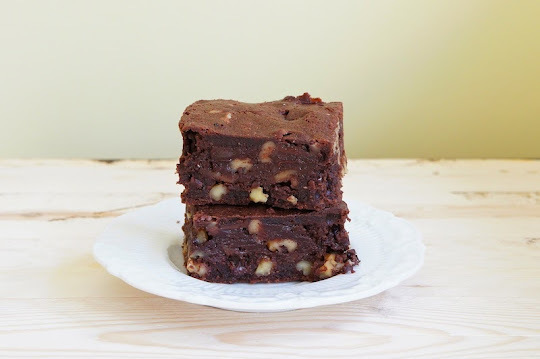 Gradually add the eggs, vanilla extract, sugar, and followed by the flour, sea salt, chocolate chips and walnuts, stirring only until each ingredient is incorporated. Scrape the batter into the pan and smooth the top with a spatula. Bake for about 20 to 25 minutes. Transfer the pan to a cooling rack and allow the brownies to cool for about 20 to 30 minutes. Then run a blunt knife around the edges of the pan and unmold the brownies; remove the parchment paper and turn the brownies over to cool to room temperature. When ready to serve, cut the brownies into 12 pieces.